Our unique, sensitive facial formula will revolutionize the way you remove unwanted and unsightly facial hair. Facial hair is extremely problematic for women. Hormonal changes wreak havoc on our skin, creating bumps, pimples and hairs in places we wish to hide. We have created a 2-step solution to both prepare and replenish your skin which is gentle enough to use on your face. The unique blend of 26 Dead-Sea minerals and mud provide intense moisture and deep nourishment to your skin. While removing all unwanted hair, generating sensual, silky smooth skin for long-lasting results - without creating stubbly regrowth. PRECAUTIONS: For External use only. Not for use on mucous membranes; the lips, eyes, nose, perianal or genital areas and breasts. Do not use on scars, moles, spotty, broken, irritated, shaved or sunburnt skin, on skin which has been depilated in the last 72 hours or on skin which has suffered an adverse reaction to hair removal creams in the past. After use, we recommend waiting 24 hours before applying an anti-perspirant, a perfumed product, swimming or sunbathing or using artificial tanning equipment. Always wait 72 hours between applications. Remove all jewellery. If the cream touches any of the areas not intended for use rinse thoroughly with cold or lukewarm water. If irritation occurs, consult your physician. SAFETY INSTRUCTIONS: ALWAYS TEST A SMALL PATCH OF SKIN (WE RECOMMEND THE INSIDE OF YOUR WRIST) WITH THE PRODUCT 48 HOURS BEFORE USING ON OTHER AREAS OF YOUR BODY. 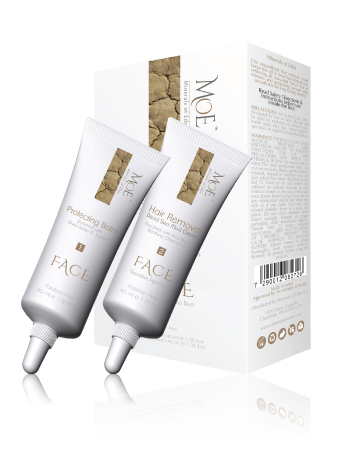 Designed to be used on certain areas of the face; Chin, Upper Lip, Cheeks and Jaw Area. If a rash, reaction or irritation occurs, DO NOT USE THE HAIR REMOVAL PRODUCT. Avoid contact with eyes. In the event of contact with eyes, rinse immediately with plenty of water and seek medical advice. Avoid contact with skin except as indicated on the precautions. Wash hands after use. Store in a cool dry place. Do not store contents under direct sunlight. Dispose of empty packaging with household rubbish. Lightly apply Facial Protection Balm to the areas you wish to treat. Treat only once so that hairs aren't overly coated. Use your fingers to massage the Balm into your skin, going beyond the area you wish to treat. Massage for 30 seconds in a circular motion to form a thin pre-treatment layer that keeps the Hair Removal Cream from coming in direct contact with your skin. Spread a thick layer on the area you wish to treat. Do not rub in. Leave for 6 minutes, then rinse off under the shower, or wipe off using wet/dry tissues then dry gently. Use only with the Facial Protection Balm provided. Awesome way to get rid of unwanted hair in your face !! This is super good and removes hair effectively. I haven't had any troubles using the cream and I must say that this system does't smell bad at all like many other products from other brands do. Absolutely fantastic product. It works just in 6 minutes. will recommend to everyone! A hair removal product not tested on animals! I love this hair removal system! It didn't burn like some of the others I have tried as well as it didn't break me out. I have not experienced any itching so far which is AMAZING!! Love this hair remover! Works like a charm leaving skin silky smooth without causing breakouts the way waxing does. Love that it's natural and doesn't have a harsh chemical scent and doesn't burn or irritate sensitive skin. This is the only one I use and it's been great. Only wish I would have purchased it years ago. My Facial Skin has never felt as smooth and soft!!! Ladies, you Must get this ASAP!! !